It's easy to keep your dogs healthy! 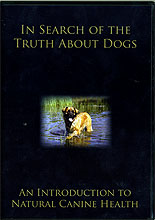 Dog lovers around the world have been on a journey of discovery. Too many young dogs suffer debilitating chronic disease and die years before their time. Something is going desperately wrong with the health of dogs, and armed with the information in this DVD, you can protect your canine companion and look forward to years of life together. *Why it's harmful and unnecessary to vaccinate every year. *The best way to feed your dogs for long life and robust good health. *Why vets and other professionals now have the courage to speak out and challenge the system. *How thousands of dog lovers around the world keep their dogs safe and well. Learn about the most recent developments in the natural pet health care movement from well known international experts. Dr. Christopher Day, British Veterinary Homeopath and author explains how over-vaccination causes sometimes fatal health problems in our companion animals and how to avoid these problems. Dr. Michael Fox, U.S. and British Veterinarian and author of Dog Body, Dog Mind and Healing Touch for Dogs explains how contaminated ingredients got into hundreds of pet food brands in the United States in 2007 causing the death and suffering of thousands of animals. And Catherine O'Driscoll, author of Shock to the System and What Vets Don't Tell You About Vaccines, interviews both experts and pet owners about how the natural approach to animal health is improving the health of companion animals.